today is the second anniversary of my first japonisme post!! i have learned so much, and met so many fascin- ating people! thank you all for the many treasures you've added to this blog. it's also the 16th anniversary of beginning my 12-variety iris garden! Issa imagines that the rainbow has arisen from blooming irises--the intense, showy colors of the flowers continuing in bold streks upward, into the sky, forming the rainbow. It's interesting that "iris" derives from the Greek word for "rainbow." Issa could not have known this, but he intuits the same connection that exists in many Western languages. The rainbow is a flower in the sky; irises are rainbows on earth. Issa bends down low to acknolwedge and appreciate a small flower. There is a world of meaning in this simple act of paying reverent attention to things that other people ignore. 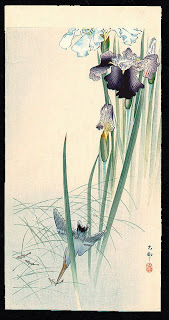 The tiny-petaled iris is as precious as the big, bold chrysanthemum. Issa's approach to the living universe is democratic. Congratulations, Lily. What an achievement, from two years of hard work (and years before of learning and understanding) to create this site, where anyone in the world can come and share your knowledge and excitement. A friend in the States sent us a Japanese roof iris, which flowered for one year but then disappeared. We still have wagtails, though! thank you neil. that's not an iris i was familiar with until your mention, so thank you. 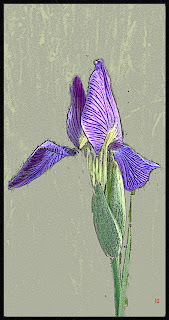 i once owned a book all about irises all over the world. it was written in england. not one of those irises were available around here! but one thing i've learned from haiku is that iris is commonly used to make thatched roofs. do you think that's what it refers to? and in fact i also went and looked up wagtails as well, and they do live here, though if i've seen one i've not been aware of it. thanks for sharing some of that excitement back, neil. Wow! What a wonderful achievement! I watch those terrible videos from Minneapolis and St. Paul... and then I see the latest post on your blog, and I can sleep, knowing that what matters is being tended too... a gardener of what is most deeply human. Let it bloom... let it bloom..
jacob-- you've helped me by saying that, such kindness. we must have hope. Bonne anniversaire Lotusgreen et félicitation pour ton superbe blog. Congratulations on your achievement! That's quite a milestone. The irises look lovely as well! thank you so much, margaret. Congrats , and keep up the great work. Thanks for all the eye-candy and insight. thanks so much, dominic! and what a great line! Très bel anniversaire, Lotusgreen : un petit verre d'umeshu pour fêter les prochaines floraisons de Japonisme ! c'est une bonne idee! et merci. Happy Anniversary! Your blog is one that I visit often and appreciate deeply - it's unique, informative and beautiful. Thank you for sharing with us and for all your hard work. oh, thank you so much namastenancy. i'm so glad to meet you.